CHICAGO, IL The Chicago Force have kicked-off their season with a 63-0 win over the West Michigan Mayhem. The win marked the 100th improved their record to 100-21 all-time. The Force won the coin toss and received the ball to start their 2015 season at their new home Lane Stadium. West Michigan pinned the Force deep on their first possession, as quarterback Rachel Gore took over the offense on their own 13-yard line. It marked the only time in the game that West Michigan seemed to have control over the Force as they forced a quick punt with 13:27 left in the first quarter. It was all Force from that point on. Chicago ´s defense shut down Michigan’s heavy running attack and got the ball back quick. After their punt, running back Cassey Brick completed a phenomenal 79 yard run on their first play from scrimmage scoring the first points of the season and bringing the Force ahead 8-0 after a 2-point conversion. Brick had a fantastic day amassing 229 yards from scrimmage and being responsible for 18 of the 63 points on the day. She was named the Offensive Game Day MVP for her efforts. Turnovers were West Michigan ´s primary concern. Three fumbles and an interception returned for a touchdown by Jamie Fornal forced the Mayhem into a hole early, being down 38-0 after the first quarter. Sonja Drangsholt, Melissa Nelson, Sarah Rogers, Kelsey Casey and Kim Marks led the defense. 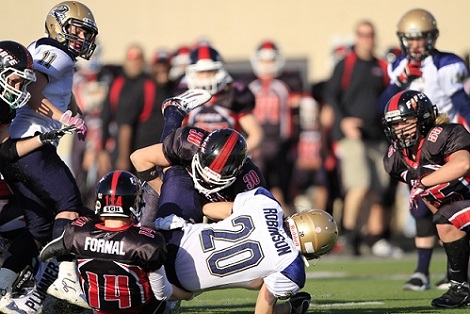 Drangsholt had eight tackles and was named the Defensive Game Day MVP. The second and third quarter continued with more of the same. Gore's ability to sell the read option fake frequently confused defenders on the Mayhem, which opened up space for runners left and right. Coach John Konecki ´s quick strike offense built around quick screen passes to the outside, led to receiver Jeanette Gray ´s success from scrimmage. Gray had 57 total yards with 2 touchdowns on the day. Gore showed her efficiency and versatility on several plays, not only passing the ball but finding options on third down to keep the ball moving. If she couldn ´t find the open man, Gore took to her feet and beat defenders with her speed and elusiveness. Gore had 77 yards in the win, including an impressive 52-yard run in the third quarter, putting the Force up 63-0 with 6:06 left in the third. Gore also had 105 yards passing and 3 TD ´s through the air. 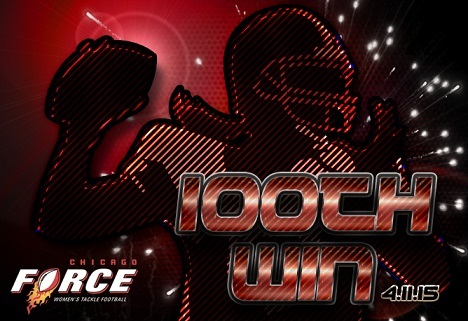 It was a deserving win for the Chicago Force, who are looking to prove their dominance in the Women ´s Football Alliance, with their fast pace no-huddle attack and an inexperienced but energized defense. The Force go on the road next week to play the Detroit Dark Angels in another divisional game. The next home game will be May 9th when Chicago takes on the Indy Crash at Lane Stadium in a 5pm start time.